Read his lips: Does tax pledge put Obama on shaky ground? WASHINGTON (CNN) -- "Read my lips: No new taxes." 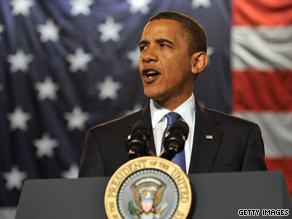 President Obama has said he will not raise taxes on those making $250,000 or less. That famous phrase from George H.W. Bush came as he accepted his party's presidential nomination at the Republican National Committee convention in 1988. At the time, it was exactly the red meat Republicans were looking for. But campaigning and governing are two very different things. Bush was elected as the nation was slipping into a recession. When confronted with a growing national deficit, he had to find a source of revenue. That revenue came in the way of raising taxes, a move that especially rankled members of the GOP and became an issue for Democrats to run on in 1992. Democrat Bill Clinton was swept into the White House. Pushing forward to 2009, another president may have trekked onto the same territory. On Monday, the White House sought to shoot down concerns that middle-class families may face a tax increase in order to combat rising deficits and a struggling economy after its two top money men floated the idea that tax increases to fund the nation's economic recovery could extend beyond the wealthiest Americans. "The president was clear during the campaign about his commitment on not raising taxes on middle-class families," White House press secretary Robert Gibbs said Monday afternoon. "I don't think any economist would believe that, in the environment that we're in, that raising taxes on middle-class families would make any sense." Treasury Secretary Timothy Geithner and Larry Summers, director of the National Economic Council, said Sunday that they could no longer guarantee that the middle class will be spared a tax increase. During the 2008 presidential campaign, Obama said over and over that the middle class -- which he defined as anyone making less than $250,000 -- would not face any tax increase. "If you make under $250,000, you will not see your taxes increased by a single dime. Not your income tax. Not your payroll tax. Not your capital gains tax. No tax," he said at a campaign event in 2008. But as with most presidents dealing with soaring deficits, raising taxes is often a necessary evil, no matter the political costs. "Clearly, the administration is looking for ways to pay for things, including health care. ... They may have to look for other alternatives," said Stuart Rothenberg, editor of the nonpartisan Rothenberg Political Report. Ali Velshi, CNN senior business correspondent, argues that the deficit problem is a must-tackle for any administration. "You've got to fix [the deficit problem]. Because if you don't, it's going to start to hurt everybody, and I think that's what the president's financial advisers and all of those economists are saying: 'Guys, we've got to address this head-on,' And that means lowering the volume on the talk of no new taxes." But Bush is hardly alone when it comes to a president going back on his tax promise. Jimmy Carter, Ronald Reagan and Bill Clinton also sought to stop rising deficits by increasing taxes. Clinton, like Obama, spent much of his campaign touting a middle-class tax cut. But once elected, he supported raising taxes on gasoline and other services, which hit all tax brackets. Reagan supported raising them during his first term as the country faced recession. He also supported adding $165 billion to aid the Social Security system. In the end, that raised payroll taxes, among other things. Reagan's predecessor, Jimmy Carter, was also forced to raise taxes on payroll, Social Security and gasoline -- despite campaigning on the no-tax-increase vow. James Horney, a director at the nonpartisan Center on Budget and Policy Priorities, said that although it's not favorable to raise taxes during an economic slowdown, there has to be a mechanism in place to rein in spending and pay for key Obama programs, such as health care and economic recovery. "It's clear that as we come out of this economic downturn, we really need to turn our attention to the longer-term deficit problem and take steps that will bring the deficit under control, which will, I believe, necessarily lead to dealing both with reductions in spending and increases in revenue," he said. "It takes a balance to approach both revenues and spending, and it takes basically putting everything on the table ... taking a good hard look on how best to increase revenues and cut spending." Republicans would simply "attack and say, 'there you go; we told you he was a big taxer,' " Rothenberg said. The other factor for Obama would be with fiscally conservative Blue Dog Democrats and other Democrats who stood with Obama on the middle-class tax pledge. Bill Schneider, CNN senior political analyst, said, "Republicans are going to jump all over this." He added that it is very likely that the next time Obama takes questions from the media, "a reporter will ask him whether he endorses or repudiates what Summers and Geithner said." So is there a way for Obama to raise taxes on the middle class -- despite his repeated campaign promises -- and still remain in good standing with the same constituency? "By arguing as George Bush, the dad, did. That it was needed. That he had to have this money to fund a variety of things to bring down the deficit," said Candy Crowley, CNN senior political correspondent. Rothenberg said that such a move by the Obama administration "wouldn't have quite the same response in his party that the first George Bush felt when he said 'no new taxes' and turned around and agreed to raise taxes." "Because the anti-tax fervor is so strong in the Republican Party, than it is in the Democratic Party, so while this president wouldn't particularly suffer from backlash among Democrats ... his greater problem would be among independents and Republicans who will then use that," he said. And the backlash has begun. "I think that what the secretary and Mr. Summers said Sunday is actually more true than the press secretary [Robert Gibbs] tried to make it out to be [the next day]," Sen. John Kyl, R-Arizona, said Monday. "It's simply a recognition of a reality that you can't pay for all of this and not impose taxes on middle Americans." His colleague Sen. Lamar Alexander, R-Tennessee, said it was likely that Geithner and Summers "were taken to the woodshed" by Obama for their comments on the Sunday talk shows. When asked about that, Gibbs said they simply had a discussion of the economic situation.